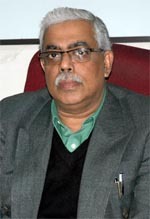 Sugata Marjit is currently the Reserve Bank of India Professor of Industrial Economics at the Centre for Studies in Social Sciences, Calcutta. He was the first Sukhamay Chakravarty Chair Professor, CESP, Jawaharlal Nehru University and was a Professor of Economics at the Indian Statistical Institute. A topper of Calcutta University he received his Phd in Economics from the University Rochester in 1985. He received the Mahalanobis Gold Medal of the Indian Econometric Society in 2002 and the VKRV Rao National Prize as a young Social Scientist in 2003, among the very few who have received both. He held visiting professorial positions at the Universities of Bonn, Copenhagen, Cornell , Erasmus , Monash, Munich, Konstanz, New South Wales, Queensland, Penn. State, Rochester etc. and was a visiting scholar at the IMF, ADB and the Federal Reserve Bank, St. Louis, USA. His papers have been published in well-known journals such as the American Economic Review, Journal of Economic Theory, Journal of International Economics, Journal of Development Economics, European Economic Review, International Economic Review, Canadian Journal of Economics, Economics Letters etc. Oxford University Press, SAGE and Springer-Verlag have published his books and edited volumes.